"That's why older people are more susceptible to infections than younger people," explains Janko Nikolich-Zugich, MD, PhD, co-director or the University of Arizona Center on Aging and chairman of the Department of Immunobiology at the University of Arizona College of Medicine – Tucson. In search of a way to rejuvenate the immune system of older adults, Dr. Nikolich-Zugich and Megan Smithey, PhD, have found that one particular virus may not weaken, but actually enhance our immune system. Their findings are published this week in the Proceedings of the National Academy of Sciences. Drs. Smithey and Nikolich-Zugich wondered how this lifelong virus ultimately affects the immune system. 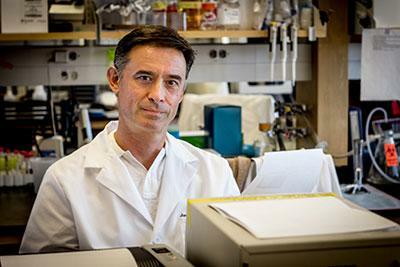 The researchers are not certain how CMV strengthens the immune system — they are investigating that in a separate study — but they do believe they have gained new insight into the aging immune system. When the researchers examined the mice's T-cells — the army of defenders that fights off infection — they found that both groups of older mice had a decent supply of diverse T-cells. "Diversity is good," Dr. Nikolich-Zugich says. "Different types of T-cells respond to different types of infections; the more diverse T-cells you have, the more likely you'll be able to fight off infections." But Drs. Smithey and Nikolich-Zugich's new study shows that T-cells are almost as diverse in old mice as they are in young mice. The problem is that diverse T-cells are not recruited to the battlefield in older mice — unless they are infected with CMV. Dr. Nikolich-Zugich explains, "It's as if CMV is issuing a signal that gets the best defenses out onto the field." "This shows that the ability to generate a good immune response exists in old age — and CMV, or the body's response to CMV, can help harness that ability," Dr. Smithey adds. The UA College of Medicine – Tucson team plans to continue to study CMV. It hopes to see similar results in human studies. The team's ultimate goal is to create a vaccine that can improve the immune system of older adults and protect against infection. The studies were supported by a grant from the National Institute on Aging, one of the National Institutes of Health. Dr. Nikolich Zugich also is a member of the UA BIO5 Institute. Dr. Smithey is a research assistant professor who specializes in immunobiology and a member of the Arizona Center on Aging. The University of Arizona College of Medicine – Tucson is shaping the future of medicine through state-of-the-art medical education programs, groundbreaking research and advancements in patient care in Arizona and beyond. Founded in 1967, the college boasts more than 50 years of innovation, ranking among the top medical schools in the nation for research and primary care. Through the university's partnership with Banner Health, one of the largest nonprofit health care systems in the country, the college is leading the way in academic medicine. For more information, visit medicine.arizona.edu. The mission of the University of Arizona Center of Aging is to promote long, healthy and functional lives for older adults through comprehensive programs in research, education and training, clinical care and community engagement. The center exists to improve quality of life and to extend the healthspan of older adults. For more information, please visit aging.arizona.edu. The University of Arizona Department of Immunobiology is home to basic research in immunology and microbiology. Its mission is to advance the insights into the biology of microbes and the defense against microbial infections in order to develop future therapies for infectious, autoimmune, and malignant diseases. For more information, please visit immunobiology.arizona.edu.